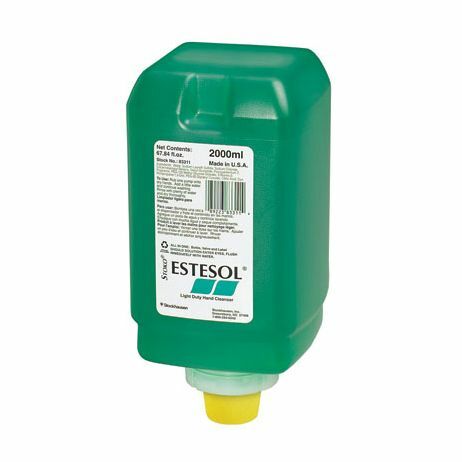 Stoko ® Estesol® 2000ml Softbottle Liquid skin cleanser for light dirt, with strong washing power and good skin compatibility. Estesol® is a soap-free skin cleanser with strong washing power and good skin compatibility. It thoroughly cleans all light dirt which can be removed without the use of scrubbers and solvents. 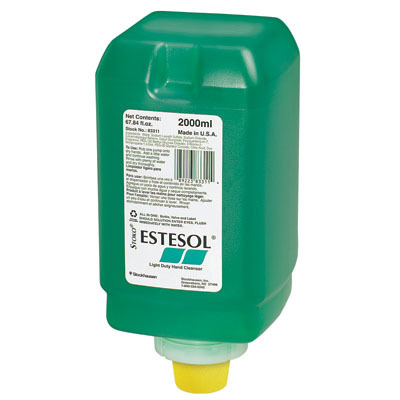 To improve skin compatibility, ESTESOL® contains a mild surfactant made up of sugar tensides. Use • Rub small amount of Estesol® thoroughly onto dry hands. • Add a little water and continue washing. • Rinse with plenty of water and dry thoroughly. Features and benefits • Good skin compatibility. • 1ml of product dispensed per pump. • Pleasant fragrance and feel. • Excellent lathering properties. • Gentle to the skin even with everyday use. • 2000 washings per bottle ensures cost savings over many competitive liquid products. • Encourages handwashing. • Easily covers skin surfaces and promotes sustained handwashing.